The vast marsh between James Island and Folly Beach harbors myriad tucked-away tidal creeks. From Folly Landing, head south to Bird Key for a peek at nesting oystercatchers, piping plovers, and terns. (The island is closed, so gaze from your craft). Then make the 45-minute paddle to Bowen’s Island Restaurant and enjoy a cold brew. THE INS & OUTS: Before you put in, be sure to check the tides. You want to plan your paddle so you’re not returning against the tide with tired arms. The state Department of Natural Resources offers a weekly tide table with information from various stations at www.dnr.sc.gov/news/tide.html. Who: Ralph Earhart, age 60, owned the same motorboat for 16 years. Fed up with repair fees, he gave it to his mechanic in 2002. His true passion soon revealed itself when a coworker lent him her son’s kayak. Paddling Resume: While researching his book, Kayak Charleston, Ralph paddled more than 2,200 miles through every navigable waterway within an hour of the city. The guide details each trip, from landings to tidal recommendations. Ralph also recently began a guide service (www.kayakcharleston.net). 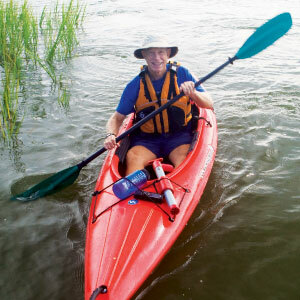 Gear Up: Ralph always packs zinc oxide, sport sunscreen, and a wide-brimmed hat when heading out in his favorite recreational kayak, a “Pungo 120” by Wilderness Systems. From five locations, Charleston’s oldest outfitter covers every corner of the Lowcountry. Kayak with a top-notch naturalist or canoe down the Edisto River to their tree house cabins.